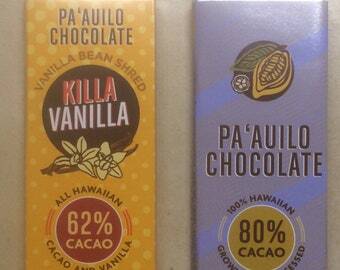 Pa'auilo Chocolate, HAWAIIAN GROWN Chocolate. Announcement Pa'auilo chocolate processes the entire output of the Blesh-Hill Cacao Estate which is located near Pepe'ekeo on the Big Island of Hawaii's Hamakua coast. The orchard which bears this chocolate is young and comprises about five hundred cacao trees. This single origin chocolate is delicious and unique. Pa'auilo chocolate processes the entire output of the Blesh-Hill Cacao Estate which is located near Pepe'ekeo on the Big Island of Hawaii's Hamakua coast. Sweet 62% Hawaiian Vanilla Chocolate with subtle shreds of Hawaiian Vanilla bean. CHOCOLATE BARS 80% cacao made with Hawaiian Cacao and Hawaiian Cane Sugar. This stuff is AMAZING! The chocolate tastes great and has been helping a lot with my anxiety and sleeping problems. Each bar comes with 5 pieces and eating just 1 piece does the trick. The cherry on top is free shipping and I received it in only a couple of days too! Works better than any teas I've tried to help with relaxation. I can't wait to buy again for both myself and as gifts to friends.